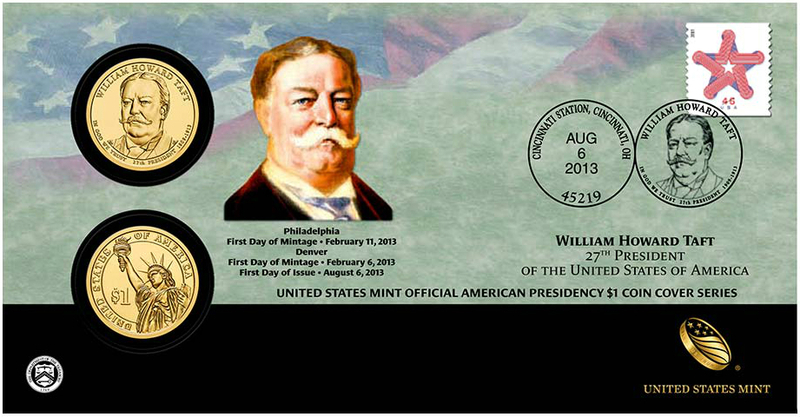 The Presidential $1 Coin Program reached its 27th release with the 2013 William Howard Taft Presidential Dollar. 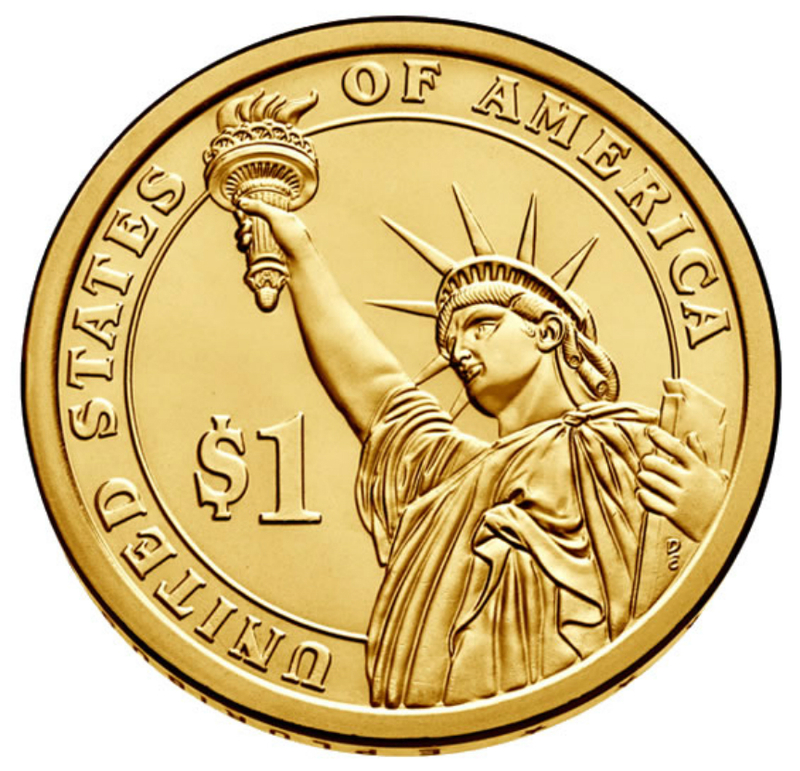 Following a decision made by the Treasury Department, the coins were not produced for release into general circulation, but only struck in the limited quantities necessary to satisfy collector demand. William Howard Taft served as a federal circuit judge, before being appointed as the Governor-General of the Philippines by William McKinley and appointed Secretary of War by Theodore Roosevelt. He won his bid for Presidency and served one term from 1909 to 1913. Following the Presidency, he served as the Chief Justice of the Supreme Court. 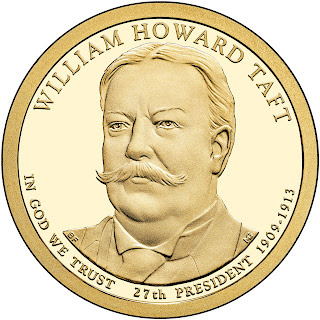 The obverse design for the William Howard Taft Presidential Dollar features a portrait designed by Barbara Fox and sculpted by Michael Gaudioso. The inscriptions surrounding the portrait include his name, the motto “In God We Trust”, the order of the Presidency, and the dates of the term served. 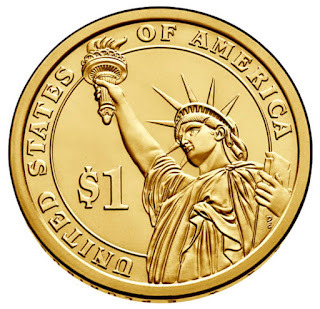 The reverse design for the coin features an image of the Statue of Liberty designed and sculpted by Don Everhart. Inscriptions include “United States of America” and the denomination expressed as “$1″. Incuse edge inscriptions of the coin feature the additional required motto “E Pluribus Unum”, along with the date of issue “2013”, and the mint mark of either “P”, “D”, or “S”. 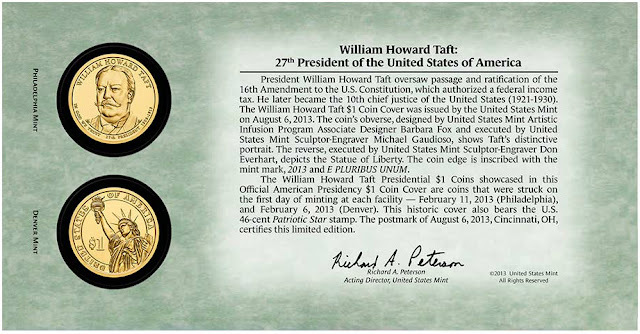 On July 9, 2013, the United States Mint began accepting orders for 25-coin rolls, 100-coin bags, 250-coin boxes, and 500-coin boxes containing circulating quality versions of the William Howard Taft Presidential Dollar. Separate products were available containing coins from either the Philadelphia or Denver Mint facility. The packaging of the products included the name of the President, the mint or origin, and the face value. 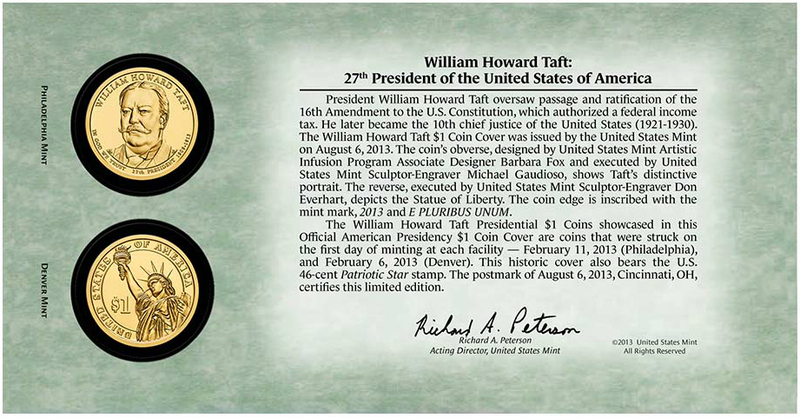 Throughout the year, other numismatic products were also released containing the William Howard Taft Dollars. These included various annual coin sets, Presidential $1 Coin sets, the Presidential $1 Coin Cover, and Presidential $1 Coin & First Spouse Medal Set. The total mintage for the circulating quality version of the coin reached 8,120,000 pieces across the Philadelphia and Denver Mint facilities. William Howard Taft (September 15, 1857 – March 8, 1930) was an American jurist and statesman who served as the 27th President of the United States (1909–1913) and as the 10th Chief Justice of the United States Supreme Court (1921–1930), the only person to hold both offices. Taft was elected president in 1908, the chosen successor of Theodore Roosevelt, but was defeated for re-election by Woodrow Wilson in 1912 after Roosevelt split the Republican vote by running as a third-party candidate. In 1921, President Warren G. Harding appointed Taft Chief Justice, a position in which he served until a few weeks before his death. Taft was born in Cincinnati in 1857, the son of Alphonso Taft, a prominent lawyer and judge. William Taft attended Yale, and after becoming a lawyer was appointed a judge while still in his twenties. He continued a rapid rise, being named Solicitor General and as a judge of the Sixth Circuit Court of Appeals. President William McKinley appointed Taft civilian governor of the Philippines. In 1904, President Roosevelt appointed Taft Secretary of War and Taft became his handpicked successor. Taft declined repeated offers from Roosevelt to serve on the Supreme Court, deeming his political work more important. With Roosevelt's help, Taft had little effective opposition for the Republican nomination for president in 1908, and easily defeated William Jennings Bryan for the presidency that November. In the White House, Taft focused his attention on the Far East more than European affairs, and repeatedly intervened to prop up or remove Latin American governments. Taft sought reductions to the tariff, then a major source of governmental income, but the resulting bill was heavily affected by special interests. Taft's administration was filled with conflict between the conservative wing of the Republican Party, with which Taft often sympathized, and the progressive wing, to which Roosevelt moved more and more as the popular ex-president became disenchanted with Taft's policies. Controversies over conservation and over antitrust cases filed by the Taft administration served to further separate the two men. Roosevelt challenged Taft for renomination in 1912. Taft used his control of the party machinery to gain a bare majority of delegates, and Roosevelt bolted the party. The split left Taft with little chance of re-election, and in Wilson's victory won only Utah and Vermont. After leaving office, Taft returned to Yale as a professor, continuing his political activity and working against war through the League to Enforce Peace. In 1921, President Harding appointed Taft Chief Justice, an office he had long sought. Chief Justice Taft was a conservative on business issues, but under him, there were advances in individual rights. In poor health, he resigned in February 1930 and after his death the next month was buried at Arlington National Cemetery, the first president to lie there . 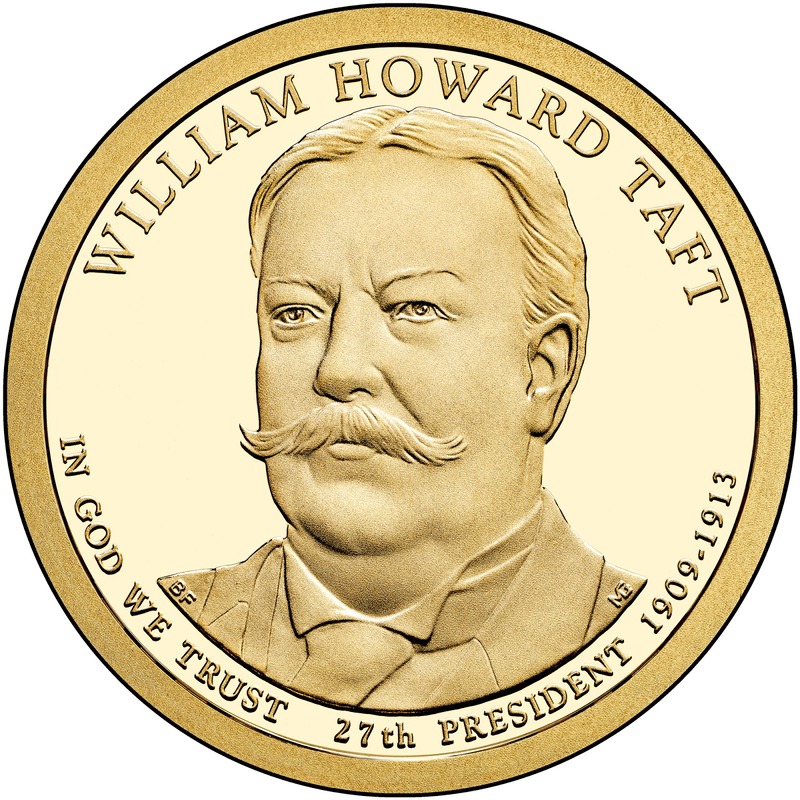 Taft is generally listed near the middle in historians' rankings of U.S. presidents.